Lately, we are seeing more headlines, about the original astronauts who ventured beyond earth, into space, passing away. It seems that few people, including me, remember most of these men, even though they did make it into the newspapers and newsreels, as well as the NASA annals and many the history books. Last week, Alan Bean, the fourth man to walk on the moon, passed away. 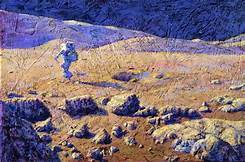 When I read the headlines, my first thought, was I am not familiar with Alan Bean. How can I be unfamiliar with only the fourth person, to walk on the moon? There were twelve Americans who were so privileged; Neil Armstrong, the first man to step foot on the lunar surface, whom I believe most people are still aware of, as well as Buzz Aldrin, who accompanied him on the historic journey, landing on July, 20 1969, in Apollo 11. Pete Conrad and Alan Bean were on the next mission, then Alan Shepard, the first American in space, with Edgar Mitchell. David Scott and James Irwin, John Young and Charles Duke, and finally Eugene Cernan and Harrison Schmitt; with Bean’s passing there are only four men left who walked on the moon. When President Kennedy first proposed landing a man on the moon, his desire was of course multi-faceted, he hoped to give the United States a solid win in the space race with the Soviet Union, as well as to soften the shock and humiliation of Sputnik and Yuri Gagarin, becoming the first man in space on April 12, 1961. It is important to note that the partnership we now have with Russia, was actually proposed by President Kennedy, who suggested both nations work together to land a man on the moon; the Soviets were not interested in a joint venture. But the President also knew that outer space would play a role in defense and scientific research that should be for the good of all mankind, not restricted to a nation with less than altruistic beliefs. For me, the American space program, specifically of days gone by, encapsulated all that was good, noble, and diligent about our character, as a nation. Americans have historically demonstrated a “can do” spirit that says there are no insurmountable odds; and a spirit of integrity and honor. When I think back to what the endeavor of conquering space reflected about the American character, I often think of the moment, in “Apollo 13” when a group of men with short sleeved white shirts, and pocket protectors, walk into a room, caring boxes that they dump onto a table, saying: “Okay people listen up, the people upstairs have handed us this one, and we need to come through. We need to find a way to make this fit into the hole for this, using nothing but that.” https://www.youtube.com/watch?v=ry55–J4_VQ Which amazingly they did! Can you imagine that task being put before you? Yes, like in so many other segments of life, women’s roles in the space race were restricted and their actual contributions were not lauded. If you happen to have HBO, you might well be as tired of flipping channels and seeing “Hidden Figures” as I am, but if you saw the movie, you cannot help but stop, even if just for a moment or two and think about what an outstanding movie it is. The film highlights three African-American women who were involved in the space race, each making meaningful contributions that have barely been acknowledged, until now; but it is so inspiring to see the lives of Katherine Johnson, Dorothy Vaughn, and Mary Jackson – if you have not seen this movie or read the book, of the same name, I encourage you to do so. Now, it seems the “space race” is about commercialism and not unknown wonders; who will be the first to offer round trip flights to the space tourist. I know that I am not overly engaged in following anyone’s progress, in this area. But I do remember, as a child, when a launch into outer space was worthy of bringing a television set into a classroom or being called in from play to sit and watch a rocket soar off into the wild unknown, or even a man step on the moon. I cannot honestly say I was properly awed by those early endeavors that I electronically witnessed, but I well enough understood that the adults in my world were reacting, as they were, because somehow these moments mattered to us all, even if a connection between the average citizen, the newscaster, and NASA was not clear to a little girl. President Kennedy was told that it would cost approximately twenty two billion dollars to land a man on the moon, by the end of the decade. The value of this endeavor was not positively monetized when the President tried to rally the support of the American people, and there were many who took legitimate issue with the cost, but as a nation, we backed this program believing it was worth the expense and even more so, the personal investment of fearless souls who went out into the unknown, not for the hope of a multimillion dollar paycheck, but for mankind and personal achievement. As we lose this generation of hero’s, with their adventurous and fearless spirit I wonder who will take their place? Who will inspire the next generation to live their dreams and to make their dreams larger than life? Where are the people who are not living only for themselves, but for mankind in general? Anymore, it seems we only collectively gather around our televisions, to watch sporting events, some do inspire but not in the same way; today even Olympians are often professional athletes. We need goals and dreams that span the interest of our entire nation, uniting us in a common cause that we can all agree upon! Whether we decide to eradicate huger or colonize Mars, it is time for America to dream again; and to work together to see our dreams materialized. We are a nation of determined individuals, but we are also a nation of people with shared values that no longer seem to dominate our dialogue. I know that the list of people and professions I admire is radically shrinking. So please, I implore you, if there is something dreadful about the space program, that you have personal knowledge of, do not write me; I need to believe in those courageous heroes and heroines, and I think I am not alone in this need. The negativity of our society is overwhelming, but American character really is immersed in hope. From the Pilgrims who left England, on their sailing ships, to the Pioneers, who left St. Louis, in their covered wagons, we are a people who go, believing that perils of the journey will be worth it; we believe we will make a better life not only for ourselves and our families, but for humanity. What are your dreams for America? What can you imagine us accomplishing? What would you like to see changed? What do you choose to do? That is all for now. 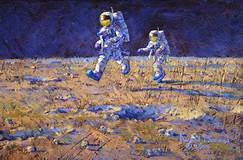 Paintings in this article by Alan Bean, copied from the internet. This entry was posted on June 1, 2018 at 1:14 pm and is filed under From the Editor, LeftSide, SlideShow. You can follow any responses to this entry through the RSS 2.0 feed.